I have a red jacket that is an "all-weather" coat of sorts. When I bought it, I thought it would make a good rain coat as well. I found out about a month ago that I was wrong. As usual on Saturdays in the fall, we attended the University of South Alabama football game, on this particular day against Troy State University. The forecast was for rain and no umbrellas are allowed in the stadium, so I wore my red coat. 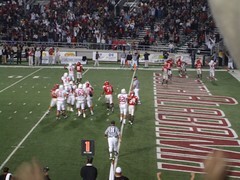 Since red is the predominant color of South's red-white-blue color theme, it fit in perfectly. Then the rain started. As the first the drops beaded up and rolled off my coat I felt snug and comfortable in my coat. Then the material began to be saturated with water and the rain began to soak through my coat instead of run off it. The rain continued throughout the whole game and as loyal fans, we stayed until the end. Halfway through the game the rain had soaked all the the way through my coat, through my shirt to my skin. To make matters worse, we lost 31-10. I was thinking about that slow soaking the other day and I realized that is sometimes how it is when we read the Bible. At first the truths and the realities of the Bible seem to just roll off us. But the more we continue to read, perhaps day after day after day, eventually they sink into our hearts and minds and spirits until finally we become saturated with them. The Scriptures then come to our minds readily because we have have put them into our mind so recurrently. We have the promises of Scripture at hand in moments of pain, sorrow and trial because we have hidden them in our hearts before we needed them. So let us remember to give our hearts that slow, steady soaking of the Scriptures, to daily "water" our hearts with the Word of God. We can depend upon the fact we will receive blessings untold by doing so. In cooking heat is a good thing and a bad thing. The perfect amount of heat is, well, perfect. But too much heat can turn good things bitter. Garlic is a great example. Let garlic cook just a few seconds too long and that sweet flavor the heat extracts turns to a nasty bitterness. Even sugar can become bitter when scorched, as when making caramel. The week before my husband and I were married, we had to take a holiday dish to a Sunday School social. I decided to take a dish that required me to make a caramel sauce. I was fairly new to cooking then, but I surely should have know better than to do what I did. The sugar had been bubbling in the cast iron skillet for a few minutes and had turned a lovely golden brown. I had removed it from the heat and added the butter and vanilla as the recipe required. Curious as to how it tasted, I dipped my right index finger into the surface of the caramel. I don't know scientifically, but experientially I'd say the temperature of that hot caramel was about 4000°! Of course, I incurred a nasty burn on the end of my finger. I think of this burn each time I look at my wedding pictures. You see, as my new husband and I stopped to light our unity candle, the hot wax ran down my candle and onto that very fresh burn on the end of my finger. I knew the eyes of everyone in the room were on us and I also knew that any reflection on my face of the pain on my finger would be misinterpreted. It was one of my greatest moments of self-control. So yes, I know heat can be a good thing, and a bad thing. There is all sorts of heat in our lives. Sometimes the heat comes from evil sources. There is sin in this world and there is an enemy who seeks to "devour" and "destroy" us. Then there are those who live evil lives and the consequences of their choices sometimes affect us as well. This is a form of heat in our lives. The natural course of sin in the world causes decay and aging. This causes heat to us as our days go by. Sometimes the heat is allowed by a kind and loving God who knows that if it were not for the moments of heat, our sweetest flavors would not be revealed -- like the garlic or the sugar. He allows that heat to deepen us, to enrich us, to cause us to turn more toward Him than we ever would at room temperature. Often we would like to remove ourselves from the pan as soon as the heat is turned on. I suppose the garlic would like to do the same. I love to watch it dance around in the pan, skating on the surface of olive oil. I fancy in my brain that it is trying to find a cool spot upon which to rest. I'm sure the sugar too would love to jump back into the container instead of melting into a brown goey liquid that becomes caramel. But if that happened, our shrimp and grits wouldn't have that wonderful, sweet garlic flavor. And there would be no addictive chocolate caramel cookies that my daughter Emmie makes. The heat is necessary, for our food and for us. We much accept the role of the Cook and His heat in our lives. We must trust the Cook that He knows when to either turn off the heat or to scoop us out of the pan. We must trust that He knows just how much heat we need to sweeten us, but not so much as to allow us to become bitter. We are His ingredients and He has no intention of ruining His dish. To the contrary, it is His intention to perfect us. 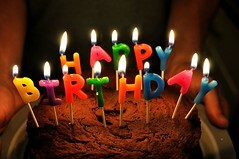 that we may present every man perfect in Christ Jesus:"
A week ago today was our son's thirtieth birthday. As is the tradition in our household, we gave him thirty birthday presents. Most of these presents were small, practical presents, but still, it is fun to open thirty presents of any sort and his wit and humor made it fun for us to watch him open them. Today is my husband's birthday and his turn to open presents. Tonight our whole family will gather together to celebrate the birthdays of these two men who mean so much to us. While we usually think of things when we hear the word gift, people are so much so a gift to us than are things. Especially since people -- those who know the Lord Jesus Christ -- are eternal. My husband and my son are two of the most precious gifts I have ever been given and I could never thank the Lord enough for them. If I wrote on this blog every moment of every day for the rest of my life I could not begin to express how these two men have blessed my heart in the thirty-six years I have known them. If I had to choose only one word to describe them both I would choose the same word: faithful. My son is a United States Marine. Semper Fidelis. . . Always Faithful. He is a Force Recon Marine. When he told us he wanted to become a Marine he told us he wanted to become "the best of the best" and he did. He has been faithful to protect and defend the United States Constitution through two deployments and I've never heard him complain or grumble about doing so. For him, it was "his job". He is also a Police Officer. He spends his time away from the Marine Corps defending the streets of our city. He puts his life on the line to protect the lives of others and he is faithful to do so. I can't think of any part of this definition that doesn't relate to my husband. He is absolutely full of faith. He is steadfast in his allegiance first of all to his Lord, to his family and to his friends. His faithfulness to his sense of duty is what strikes me so much about him. He is going to do those things which the Lord has given him to do, he is going to be there. Period. He has a strong assurance, a faithful promise and it is true to the facts, to the standard, the original --the Word of God. It is such a blessing to me to have the gifts of these men in my life. My daughters, my grandchildren of course, are equal gifts to me, but the week between my husband and my son's birthday is always a time for me to reflect upon the gift the Lord has given me in these two men. We all have those around us who are gifts -- let us "open" those packages and enjoy what the Lord has placed in our lives for our enjoyment, for our encouragement, for our instruction, for strengthening in our walk with Him. Most of all, let us acknowledge that it is the Lord who has graciously given these wonderful "gifts" to us and never cease to thank the Lord for them. For your fellowship in the gospel from the first day until now;"
We have a new Nurse Manager in our unit. Our other Nurse Manager had been there for 25 years, pretty much as long as any of us remember. In fact, she hired most of us. 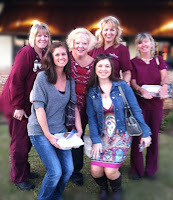 Only one of us knew our new manager, Lorie, before she came to be our Nurse Manager. The day shift nurses started to know Lorie better than those of us who work night shift. We only saw her for a few minutes before we carried our sleepy bodies home to bed. Then she came and worked a week with us. We were able to work side by side with her, to chat with her and to just get to know her. It made a world of difference in our thoughts and attitudes because she went from someone we knew about to being someone we knew. Imagine what it was like for the disciples to be with the Lord Jesus for those three years! They lived with Him, heard all His words, watched His actions. . .how glorious that must have been. But before we become jealous of what the disciples had then, let's remember during that time they did not have, nor could they even conceive of, the Holy Spirit living in them. That didn't happen until Pentecost. They knew the Lord, but they didn't really know Him until the Lord came to indwell them, until He came to be in them. God was closer to the disciples after the Lord Jesus ascended into Heaven than when He walked the earth with them because He was in them. This is true of us as believers today. The Lord is closer to us today than He was with the disciples while He was on this earth because He is IN us. Nothing can change that, nothing can remove Him from our hearts. The Scriptures say He is bound to our spirits in such a way that we are "one spirit" (1Co 6:17). Let us marvel at the time the disciples spent here on the earth with our Lord, but let us rejoice that we have Him in us now and we will have a glorious eternity filled with exploring the wonders of a God greater than we can ever imagine. No matter how dreary the day here seems, "we have great days ahead." I don't know if you've noticed or not, but there is an election coming up in our nation. In 11 days, 10 hrs and 43 minutes from the time I write this, our nation will decide to either keep the current leaders in political offices across our country or install new ones. Regardless of our political affiliation or persuasion, the Scriptures give us some clear guidelines about these authories in our lives. While the Bible of course doesn't discuss Presidents, Governors or Mayors, but it does discuss Kings and authorities. This passage is an easy one to think of when our "authorities" are those with whom we agree or support, but who was Paul's authority when he wrote this to Timothy? The Emperor Nero, who not only murdered Christians, but his own wife and mother as well. I don't know about you, but I have to confess to being much quicker to complain about our governmental authorities than to praying for them. Our Constitution does give us the wonderful right to freedom of speech, but the Apostle Paul begins his exhortation with the phrase "First of all." In other words, before my freedom of speech to my fellow citizens, I should be certain to exercise my freedom of speech before the throne of grace for these authorities. I should begin by praying for them as people, as individuals, as those who may or may not know the Lord Jesus Christ as their Lord and Savior. Then as family members because their roles as family members certainly are impacted by their roles as governmental authorities. Then as members of the offices they hold and as representatives of our country. I wonder what the difference would have been if I had been as quick to pray as I had been to complain? "Let every soul be subject unto the higher powers. For there is no power but of God: the powers that be are ordained of God." With the holidays coming, I am making a list. . .no actually two lists and since I live in a house of "foodies" my lists aren't gift lists (yet) they are food lists. I take the responsibility for our two major holiday meals very seriously. On our holiday meals, everyone is allowed one dish of their choosing. It doesn't have to fit into a menu plan or fit into any particular dietary regimen. Whatever it is they want shows up on the table. Of course there is also a perfectly cooked turkey. With four good cooks in our house, making this meal a stellar one is important, hence my two lists. One is a list of absolutely everything I need to make our Thanksgiving meal. The other is what I have already purchased toward that meal. The first list is very long. Right now the other list is short. In fact, it only has six things on it. But four of those things are very difficult to find close to the holiday so I feel as though I've made great strides on my list. I know that some of the things on my long list I already have in my cabinet, but I'll check on those closer to the baking days to know if I need a refill or not. Whenever I look at that long list and feel discouraged at how much shopping has to be done before the holiday meal can even be started, I can simply switch over to the short list -- the one with the hard to find things -- and see how much has already been purchased, and be encouraged of what has already been accomplished. Isn't that like our walks with the Lord? Sometimes we look at our lives and we see bundled around our feet our needs and our wants and we feel the discouragement pile upon our shoulders. But if we look beyond that and begin to look at everything He has already provided for us -- including our very breath -- that discouragement falls off as we realize there is not anything we need that He will not provide. And what can we want more than Him than He is not willing to give in abundance? Recently I overheard two women discussing their fingernails. 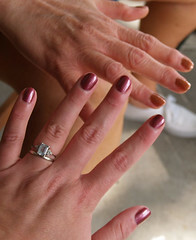 One was asking the other her secret for her long fingernails. "I tap my fingernails on something hard everyday," was what she revealed. Apparently tapping the nails regularly on a hard surface promoted a hardening of the nails, preventing them from breaking as easily. This is confirmed by Dr. Kechijian, chief nail specialist at NYU Medical Center, who recommends that time spent in activities such as typing on the keyboard or playing the piano to strengthen and speed up nail growth. He states this type of "trauma" is actually beneficial to your nails. I have heard a similar thing about trees. Living in a hurricane prone area, we are often curious about the affect of strong winds on our trees. It seems, these winds actually make the trees stronger. Apparently several years ago researcher in Illinois placed a number of young trees in a greenhouse. One group was supported by a stake. A second group was left to grow unstaked. And a third group was left unstaked but manually waved back and forth for several minutes every day. At the end of several months, the three groups of trees were measured for growth in height and trunk diameter. The staked trees were the tallest, but weakest (small trunk diameter), the unstaked trees were intermediate in height and trunk diameter, and many were not growing straight. The unstaked trees that were waved back and forth each day were the shortest but had the greatest trunk diameter, thus were the strongest. The point is that sometimes the Lord knows we need the tapping and strong winds in our lives to strengthen us. These are the events He will use. . .these winds, these taps, these tribulations to work patience in us. That patience -- those times when we see the Lord working out His provision, His strength made perfect in our weakness, will show us experiences of His sufficiency when we trust Him, and we will know the glory of trust and hope in our Savior in every situation that faces us. What confidence this brings. He is trustworthy. He has been in the past, He is in this day, and He will be in every day to come. Let the winds blow, let our fingers tap away. . .He will cause us to weather every storm and we will find we "can do all things through Christ who strengtheneth" us. in our hearts by the Holy Ghost which is given unto us." I want to tell you a story about Mrs. Becky and Mrs. Berry. Mrs. Becky has been a resident for about five years at the assisted living facility where we do services on Tuesdays. She also comes "down the hill" for our chapel services in the nursing care facility on Sunday mornings. Mrs. Berry is a new resident there at the nursing care facility. I am quite sure that Mrs. Becky never wanted to leave her home to come to live at an assisted living facility. I am also sure Mrs. Berry never wanted to leave her home to live at a nursing care facility. Having known Mrs. Becky for these five years, I know she is an independent and capable woman. I haven't known Mrs. Berry as long, but I sense in her that feeling of being the type of person to "get the job done" when the need arises. At the end of our chapel services on Sundays, Mrs. Becky has to wait for us to help take the residents to the dining room to the cafeteria, since she sits on the first row and can't get through the chapel aisle until the way is cleared. A couple weeks ago I was returning to the chapel after taking someone to the dining room and Mrs. Becky was standing by Mrs. Berry's wheelchair. They had just finished singing together the hymn, "I Need Thee Every Hour." Neither one of them had planned their respective residences to be where they have ended up, and yet, here they were singing praises to their Lord together and being a great blessing to each other and to all the other residents in the chapel. Why? Because they made the choice to continue to trust the Lord when their path took an unexpected turn. Instead of complaining or moaning, they sang. They reminded me of a modern day Paul and Silas, singing praises together to the Lord. It blessed my heart, it blessed my husband's heart when I relayed the story to him and I hope it has blessed your heart as I relay it to you today. No matter what situation we are placed into, the Lord is sufficient, He is all we need for that very moment. It is the Lord and the Lord alone who gives "songs in the night," or in the chapel in the afternoon for that matter. We do well to follow the example of these two dear sisters and choose to trust and praise our Lord with a song in our heart, and on our lips, in every turn of our pathway. Written by Annie Hawks, here is how she described writing "I Need Thee Every Hour;"
Trip 51 was about as idyllic a trip as is possible. The temperature, both air and water, were slightly cool. I was glad as the sun started to set that I had chosen a long sleeved shirt for this trip and I stored away the thought for the next trip that I might want to start wearing longer pants as well. The water was smooth, at times as smooth as glass. The sky was filled with fluffy clouds which made beautiful reflections in the water. There were the occasional jumping fish and in the sky collections of birds traveling southward. 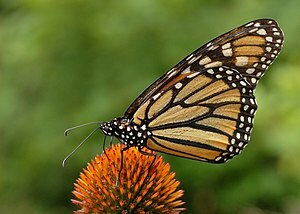 Also, the wonder of monarch butterflies provided a magical surprise to this particular trip. We both love to listen to music as we paddle. My favorite is John Doan's Eire- Isle of the Saints (A Celtic Odyssey). I love the soothing sound of this Celtic music and since my mother was a Doan, (being a 12th generation descendent of Deacon John Doane) I love to think somewhere along the line perhaps this John Doan is somehow related to me. I also have a sprinkling of Dan Fogelberg songs in my song mix, which would be no surprise to anyone who knows me. I always love it when his song, "Song of the Sea" begins playing because it seems especially appropriate while we are out on the water. The water, the sky, the breeze, the smell of the sea and the music I love all seem to have a refreshing and rejuvenating effect on me. I can feel stress falling off my shoulders and into the water as I paddle and this trip was especially so. As we neared the put-in, we sat still on our boats and watched the sunlight wane and the lights from shore begin to make long trails on the water. I think this is one of the parts I enjoy the most, when we stop paddling and just enjoy the beauty that is all around us. Neither of us say much, but we both know we are so thankful to share this wonderful experience with each other. It was a wonderful start on the next fifty trips. Today we went kayaking and I had such an incredible experience. First of all, the water was beautiful. It was calm and at some places it was a slick as glass. The sky was full of soft, fluffy clouds that made twin reflections in the clear surface of the water. There were a few fish jumping here and there and a soft breeze was blowing. But all those things happen frequently when we kayak. What we don't encounter are the butterflies. There's magic every moment, there's miracles each day. As those words were ringing in my ears I thought of what a "magical" moment it was out on the bay, the beauty of the water and sky all around and the monarch butterflies escorting us. In our lives, the Lord gives us so many "magical" moments if we will just open our eyes to see His work, His handiwork and His provision in our lives. Look for Him, look for those things which point to Him and see the miracles surrounding us each day. Update: I don't know how this post got the title "The Shy Man." That's the title of another post for another day. Sometimes there just hasn't been enough sleep on board when I start typing! Have you ever had a friend who was close to you, but then circumstances took them out of your life for a while? Did you notice when you saw them again, they just weren't the same? I experienced this profoundly after I left the University hospital where I had worked for fourteen years and moved to a smaller, private hospital. I had worked very closely with the same group of women every weekend so we were friends as well as co-workers. When I left to work at my new job, we saw little of each other. Three months later we met again to go to an obstetric conference together. Although we were all together again, things just weren't the same, they seemed somehow different. They had shared experiences in those three months in which I had no part. I had a whole new working environment that they knew nothing about. While it was wonderful to see them again, it was also very disappointing. There is One Person who is always the same. The Lord is always as He should be. He never acts in a way that violates His nature and character. He will always be exactly what we need when we need it. He is and always will be, the same. When I was teenager, I used to go to the State Fair, mainly for the greasy fair food and the fair rides. 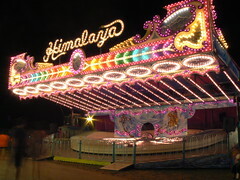 One of my favorite rides was "The Himalaya". On this ride a series of cars traveled around a circuit, dipping up and down to loud music. Midway through the ride the direction of the cars would change and they would go backward. When this occurred, you knew the ride was half-way over. Today we were talking with someone we know about being in our fifties. He said he didn't like being fifty because he knew it meant "this ride is half over." As soon as I heard that statement I felt sad. To think that these few years upon this earth might be all there is would truly give a terrible feeling as we begin to reach our older ages. But if we are Christians, we have that joyous hope and knowledge that our life will never be "half over", because we have eternal life. . .we will live forever. Our physical body may pass away, but we will immediately live somewhere else, somewhere much better. We can look at each passing day, each passing week, each passing year not with sadness and dread, but with joy and excitement. Our "ticket" isn't just for a ride of a few minutes, but for a long and glorious eternity that offers wonders greater than we can ever imagine. As my husband often says, "There are great days ahead." I like to know how things work. By that I mean, I like to know the story behind the story. How things come to be, or the story of how they practically work out that many people may not ever know. That's why I'm telling you about the little red books. Everywhere I go I carry with me a little red book. I use it to jot down ideas for this blog wherever the idea might hit me. Often the book may have several pages of as yet unwritten "Powder Rooms." Then when I have time, usually the morning after a day off, before I go back into work at night, I sit down and write several entries at one time, marking out each entry in the book as I write it as a blog post. The lovely thing about blog posts is you can schedule them to come out whenever you would like. So this blog I am writing on October 10th most likely won't come out until October 15th or later. And lest anyone think I am actually up at 4am writing my blog as my husband does his "Special of the Day. . .From the Orange Moon Cafe", no at 4am I am either at the hospital working, or sound asleep. I am not the morning person he is. The blog is usually published at 4am because that's about the earliest I think anyone would be up to read it at the beginning of a day. Sometimes the inspiration for a blog comes from something I see, such as in "The Purposeless Fence" when I noticed the fence as we were driving along. Sometimes it is something that happens to us, as in "Chocolate Explosion." Most often the inspiration comes from listening to sermons by my husband and our dear friend, John Canning. The point is, that the Lord is always speaking to us. He is always communicating, but we aren't always listening. Once we begin the habit of listening -- sort of like a new mother listening for the sounds of her baby -- we will become more and more in the habit of listening. Suddenly the whole world will explode into a cacophony of the Lord's speaking to us through various venues. We will see His truths in ways and means we never have before. We just have to allow the Holy Spirit to open up our eyes and our ears to see and hear the truth that is all around us, because ". . . in Him we live, and move, and have our being," (Acts 17:28). For more on this thought, please read "The Speaking Voice" from the book, "The Pursuit of God", by A. W. Tozer. Over ten years ago, we were buying some end tables and a lamp for our den. Our youngest daughter, then about ten or eleven, fell in love with a chaise lounge chair. "It's perfect for my room!" was her justification in our purchasing it. We liked the chair, too, and since we knew we could use another chair we decided to buy it as well. Eventually the chair ended up, not in her room, but in our living room. That chair is a wonderful example of the Lord's prevenient provision. Webster's defines the word prevenient as antecedent or anticipatory. On more than one occasion, that chair proved to be so. On February 14, 2006, at the age of 48, I had my tonsils removed. As Dickens says, "It was the best of times, it was the worst of times." It was the best of times because it was absolutely one of the best things I have ever done for myself and I wish I had done it much earlier. It was the worst of times because at 48, having a tonsillectomy is very painful. Very painful. Did I mention the pain? I lost fourteen pounds because I didn't eat more than a couple tablespoons of food for several days. I remember at one point putting my head down on the dining room table and just sobbing. And this was with narcotics on board every three hours around the clock! Before my surgery, I had been given some great instruction from a friend at work who had also had her tonsils out as an adult. "You'll have to sleep sitting up for several days," she told me. I didn't really believe that was true, but the first time I tried to lay down, I thought my ears were going to explode. That's where the chaise lounge came in. It was so comfortable, and so supportive, with it's big cushiony arms and pillow, sleeping sitting up was as cozy as being in my own bed. I was very thankful for that chair. In the winter of 2005, continuing to do push-ups after injuring my shoulder was a bad decision. It led to "adhesive capsulitis" or more commonly called, "frozen shoulder." This was easily one of the most difficult and painful periods of my life, lasting for over a year. I couldn't raise my arm, I couldn't brush my hair, I couldn't even pull my pants up on that side. Sleeping was impossible. If I laid on the "affected" side, my shoulder would be in horrible pain. If I was on my back, my arm would fall down and put more pressure on my shoulder which was painful. If I was on the opposite side, my arm would fall forward and pull on my shoulder causing pain. There was no comfortable position and no sleep. Alas, there was the chaise lounge. When I was in that chair, the arms of the chair and the big pillow behind my back cradled my arm and shoulder. There was no pressure from anywhere and I was able to sleep. It was a blessing and truly a "God-send." I have no doubt the day we were in the furniture store looking at the chair, the Lord knew what was to befall me in a few years. That chair was in the store for one purpose and there was a reason all three of us liked it when we saw it. He knew it was going to meet a need later on down the road. I wonder how many times that happens and we never even realize it? How many times has the Lord supplied our needs before we even realized we had a need? I wonder how great will be our awe and surprise in Glory when we discover just how much our Lord has done for us. Now lest you think the chair is just for recuperation, I love to sit in it and read. It is right next to the window and the western light softly shines in through the shutters. Sparrow, the sweetest beagle that ever lived loves to climb up in the chair with me and cuddle up against my legs. Soon, both she and I are usually fast asleep napping away. The chair to me is a tangible evidence that my Lord loves me and has, is now and ever will be taking very good care of me. and while they are yet speaking, I will hear." Do you remember the children's stories "Winnie the Pooh"? There were two characters in those stories named Eeyore and Tigger. Eeyore was Pooh's pessimistic, slow-talking and often sarcastic donkey friend who has trouble keeping his tail attached to his bottom. Tigger was Pooh's exuberant, energetic, cheerful friend. He loves to bounce, even bouncing on his tail. Everyone who knows me knows I love little brown bears, in fact, I have a collection of them. So naturally, Winnie the Pooh has to be a favorite. "House at Pooh Corner" is a song I love to sing to my grandchildren and they have heard it so much now, they can sing along. They are especially vocal at the part, "Winnie the Pooh doesn't know what to do, has a honey jar stuck on his nose." "Strengthened with all might, according to His glorious power, unto all patience and longsuffering with joyfulness; Giving thanks unto the Father, which hath made us meet to be partakers of the inheritance of the saints in light:" (Colossians 1:11,12). Many times as Christians we are more like Eeyore in our Christian walk than we are like Tigger. Sometimes we may be patient and longsuffering, as the Apostle Paul speaks of in these verses, but we don't have the "with joyfulness; giving thanks. . ." We seem to concentrate on the "suffering" part of longsuffering. We don't seem to be strengthened with might "according to His glorious power" at all. Other times we are like Tigger, we are full of joy and cheerfulness, quickly giving thanks to our Father who has made us "to be partakers of the inheritance of the saints in light." That joyfulness and thanksgiving shows in our every step, even in our countenance. Let us remember as we walk our Christian life that others are often led and guided by our attitudes, our actions and our choices. May we always shine forth that strength that comes not from us, but may His strength be "made perfect in weakness" (2 Corinthians 12:9) that His glorious power may be manifest to all and His Light may shine forth to our world through us. For those who love Winne the Pooh, here is a video I found of pictures from Pooh books set to the music of Loggins & Messina's "House on Pooh Corner." I wonder how many times in my life I have started something that I have never finished. Immediately as I type those words the image of my flower garden that desperately needs attention jumps into my mind. We have good intentions, even good energy to do the things in the beginning, but often, somewhere along the way, our intentions, our energy, our desire wanes. Last night we listening to a preacher, and a good friend of ours, John Canning, preach on "continuing to the end." When it comes to the things of the Lord, and the things the Lord has called us to do, it is imperative we not only begin well, but that we also finish well. In fact, "continuing to the end" or ending well, is perhaps better than beginning well. I remember when I was a fairly new Christian and was full of more enthusiasm than I was of understanding of the Scriptures, I volunteered to teach Sunday School to a group of young children, perhaps four or five years old. I underestimated both my ability to teach them and their ability to wear out my strength and endurance. After a few months, I was weary and frustrated. My enthusiasm and energy had waned and I simply gave up. Not only did I not finish well, I did not finish at all. Being faithful in whatever it is the Lord has given us to do is the most important thing we can be. I am fortunate to live with such a wonderful example of faithfulness. My husband is so faithful to the ministries the Lord has called him to do. No matter if they are increasing or diminishing, he is there. He doesn't stop, he just does what the Lord has given him to do. What is it the Lord has given you to do? It may not be teaching a class or leading a ministry. Maybe it is just being kind to a neighbor. We have a neighbor named Ralph who, in the days when we all still took the local newspaper, made it his role to put everyone's newspaper on their doorstep. He did it while he was walking his dog. Such a little thing for him, but such a big thing for that elderly neighbor who didn't have to walk down the sidewalk in the rain for her paper. (We liked it, too!) It was a kind thing to do and he was faithful to it everyday until we all stopped taking the paper. The phrase in those verses, "make full proof of thy ministry" is interesting. "Proof" there means "carry out fully, entirely accomplish." Whatever the Lord has given us to do, be it preach, witness, write a blog, visit the widows and fatherless, cook meals for the needy, give a smile and kind word for the sad, whatever. . . do it completely, faithfully and entirely. You may feel like it is such a tiny thing to do, but if the Lord has given it to you it must be very important to someone. "His lord said unto him, Well done, thou good and faithful servant: thou hast been faithful over a few things, I will make thee ruler over many things: enter thou into the joy of thy lord," (Matthew 25:21). May each of us be able to say, like the Apostle Paul, "I have finished my course" and may we one day hear our Lord proclaim to us, "Well done, thou good and faithful servant: thou hast been faithful. . ."
Victory belongs to the true and faithful. Years ago I made a gift for my friend Sheila. We are both big fans of teddy bears so I made a clay bear that wore the same scrub jacket we were wearing at work at the time. To begin, I had to roll out the clay which is hard and stiff when you first start to work it. Once I had shaped it's body parts, I had to use sharp tools to form the "fur" on the bear. I sculpted the face, the eyes, nose and mouth with the same sharp instruments. I created the jacket out of clay and "dressed" the bear. Then he was placed in a hot oven so that the clay would set. Finally I painted him to look exactly like we do at work. A final coat of polyurethane finished him off. He turned out so well and I was proud to give him to my dear friend. If my little bear were to have feelings, there would have been many times the process would have been painful to him. I'm sure the rolling out of the clay would have been too forceful to have felt good. The sharp instruments surely would have produced pain and the hot oven. . . I don't even want to think about it. Fortunately for him, he was only made out of clay. We too, as Christians, are in the process of being formed and conformed. For whom He did foreknow, He also did predestinate to be conformed to the image of His Son, that He might be the firstborn among many brethren." We are being "conformed to the image of His Son" and sometimes that means the Lord must allow painful things into our lives. Those painful things help to keep us dependent upon Him and in communication with Him. They help to correct us, to instruct us in righteousness and to give us a heart of understanding for the pains and sufferings of others. They change us. Let us not resist the workings together for good in our lives by our Heavenly Father, but let us remember that all these things are used to change us "from glory to glory" and to change us from our own image to the image of "His dear Son." I've said it, my husband has said it, I'd be willing to bet you've said it. . .
"I have to. . ."
It doesn't really matter what is at the end of the sentence, it's the verb that's important. The "have to" in that sentence makes the whole sentence sound like a drudgery, a burden, something we are obligated to do but find not one bit of joy in doing. Being a woman raised in the Deep South, I am blessed to have been the beneficiary of a great deal of chivalry. I like having doors opened for me. I enjoy having heavy things removed from my arms and carried by someone stronger than myself. I don't find it insulting at all. But it doesn't always feel like a compliment either. Sometimes there are those who can open a door or take a burden from you and yet you sense there is no joy in it for them, merely that sense of obligation, that "I have to do this" sort of mentality. Fortunately for me, the men in my life are wonderful men who truly find joy in their chivalry and it shows. "Let me get that for you," is something I might often hear as a door is opened or a burden removed from my arms. They sound not only like they mean it, but like they really like to do it. Then there is joy in it for me as well. The Scriptures tell us "In every thing give thanks: for this is the will of God in Christ Jesus concerning you," (1 Thessalonians 5:18 ). Everything He has given us to do is to be accompanied with thanksgiving. Not only that, we are not alone in the doing. ". . .for He hath said, I will never leave thee, nor forsake thee." (Hebrews 13:5). As Christians, everything we do is blessed with the presence of the Lord Jesus. This changes our "I have to" into a "I get to!" Then the things we do, no matter how menial or how lowly, become filled with gladness and joy. No matter what He has called us to do, if we are doing it with Him, it is joyful. And doing it with a joyful and thankful heart is a wonderful example of worship, praise and honor to our Lord. Today was our fiftieth trip! What a milestone. We set out from May Day Park, which has become our favorite put-in. It seems this was to be a trip for meeting people. As we were unloading our boats a man and his young son were removing their fishing gear from their truck parked next to us. They were going to fish from the pier. We had a nice conversation with them as we removed the boats and our gear, especially with the little boy who enjoyed showing off his fishing rod. We put in from the boat ramp (to avoid the sand) and headed south as usual. There was only one small cloud in the sky and the afternoon sun was bearing down on us. It wasn't long before we both felt hot. I splashed water up onto myself to cool off. As we continued on, we saw a few fish jumping again, but not nearly like the last time we kayaked. I noticed as were paddled how often our strokes would fall into the same rhythm. Silently we traveled along, our paddles making a unison chorus on the water. I reflected how like our life that is. So often we are in the same rhythm, the same pattern, two different people running together on the same path. To me it is evidence of the working of the Lord throughout our lives. We paddled about 1.75 miles before we stopped. I had marked the beginning of our trek before we started and used our GPS to track our path. It was interesting to look at the path later and see how far away from the shore we traveled and how far down from our put-in we went. As we stopped we ate our snack of grapes and snacks as we enjoyed the site of the sun coming down in front of the one lone cloud. I let my feet dangle off the side of the boat into the cool water and the whole time was absolutely idyllic. Suddenly it seemed as if the sun was setting much faster than we had expected. We turned to go back and realized just how far we had to go in so little light time. I started to paddle faster, not because I was in a hurry, but because we were then going with the current and it felt good to go fast. Glen shouted to me, "You look like you are flying!" I felt like I was flying, too! Even as we were paddling fast, it still seemed our put-in was a long way away as the light waned more and more. I was glad I had brought that amazing flashlight my son had given me for my birthday. I was already developing a plan for using it if we needed to illuminate our boats. I wasn't as concerned about seeing where we were going as I was being seen. As we drew closer to our put-in in the dusk, we encountered another kayaker and behind her a woman on a sailboat. The kayaker told us how glad she was to see us out enjoying the beautiful water. As it turns out, they live in one of the houses along the bay and are often perplexed as to why more people don't enjoy its natural beauty. We chatted with them for a few minutes before moving on, then paddled the short distance remaining to the put-in. As we were taking our boats and gear off the boat ramp, another couple stopped us to talk about our time out on the water. We were wet and carrying our gear, and the lady began taking pictures of us. I thought she surely could find more interesting subjects than these wet kayakers, but perhaps we looked better than I thought! This was a wonderful trip to cap off our first fifty trips. We have loved kayaking so much and we lave learned so much about this area in which we live by experiencing its beauty firsthand. I love the feeling at the end of a trip when we approach the put-in and I just don't want to go in. I had that feeling on this trip. I know that means we've had a wonderful time and I don't want it to end. As we were packing up, that flashlight did come in handy after all. By the time the boats were loaded in the car I needed the flashlight to see to secure them in place. Kayaking is something we love, and something we love doing together. We had two years when we couldn't kayak because of my shoulder injury and that helped us appreciate it all the more. It is special because we share it together and we love to share it with our friends. We are now looking forward to the next fifty trips. This trip was a surprise to me. Weather, commitments watching our grandchildren and my work schedule have prevented us from having a window for kayaking for over a month. I was busy working on soemthing at the house and Glen came in and said, "I thought we'd leave in thirty minutes." This is not an unusual occurrence, so I asked him just where it was we were going. "I thought we'd go kayaking." Like a flash I jumped up to get ready. Little did I know that "jumping" was to be the theme of our trip. We packed the boats and were sure to bring along the new round cooler we had recently purchased just for kayaking. It was designed to to float along in the water behind the boats. All loaded up, we headed east. We put in at May Day Park, which is now one of our favorite spots, and it was an incredibly beautiful afternoon. The water was calm, the temperature perfect, and the wind almost non-existent. The water was cool enough to be refreshing but no so cool as to give a chill. We headed southward along the eastern shore, the new floating cooler bobbing along behind my boat, or so I thought. As we paddled, I noticed I was having a hard time catching up and then keeping up with Glen. Normally this isn't an issue for me but this day I was really struggling and I was beginning to feel discouraged. It was about that time Glen noticed something was wrong with our "bobber." "It looks like its sinking," Glen said as he paddled over to me and sure enough most of the cooler was under water. That was because the cooler itself was full of water. I had been having trouble keeping up with him because I had been towing an anchor! I could barely lift it into my boat to empty it. We were glad we had only put a couple drinks in the cooler to test it and hadn't carried a meal as we often do. With my "anchor" safely stowed up on the kayak, my boat was much lighter. We paddled on a little further but the most remarkable sight stopped us and we sat to watch the wonder of our Lord's creation. All around us, and out far into the bay, fish were jumping. Not one or two, but hundreds of them. They nearly jumped into our boats and I've been waiting seven years for that to happen! It was absolutely amazing. We couldn't turn in a direction where the fish were not jumping. We sat, listened, watched and enjoyed the show. Of course, the pelicans got into the act as well, trying to take advantage of the exposed fish. Finally we turned northward toward the put-in and sat off short on our boats to watch a glorious sunset. As I looked at the sky and the sea and the sun -- and the wonderful man the Lord has given to me to share it all with -- my heart and my eyes were full. I was overcome with just how much I am blessed and with what a wonderful life I have been given. There is a dessert my husband and I love to make, but we have only made it a handful of times. The dessert is made by dipping balloons into tempered chocolate. The resulting chocolate shells are then filled with the most incredible coconut mousse. A center "hole" is scooped out and creme anglaise is poured out from the "hole" onto the plate. The final product looks like a coconut chopped in half and tastes like a piece of heaven. The reason we have only made this delectable dessert a handful of times is because it is very work intensive. The last time we made it, we involved our grandchildren, who found dipping balloons in chocolate a fun procedure. Only we didn't have the right balloons! Shortly after dipping the balloons and sitting them on the silpat, the heat from the chocolate expanded the air in the balloons and POW!! A chocolate explosion. I found little bits of melted chocolate all over us and the kitchen. There are probably still remnants of chocolate I have yet to find. Our Lord doesn't just have a little compassion toward us. His grace, mercy and longsuffering toward us isn't just a "pinch" or a "smidge". He is full -- FULL -- of compassion. He is like that balloon, full to the point of exploding His compassion and mercy and longsuffering and goodness all over everything. It gets to places we haven't even found in ourselves yet. He is so much more than we will ever, or can ever, know Him to be and it is ALL good. "O give thanks unto the LORD; for He is good: because His mercy endureth for ever." If you know anything about Alabama, you know there are primarily two types of people. Not Democrats or Republicans, not male or female, not rich or poor. No, the primary difference in Alabama is are you a fan of the University of Alabama or a fan of Auburn University? I grew up an Auburn fan. In fact when I graduated from high school I planned to attend Auburn. I changed my mind about two weeks before I was to move into the dorms. I remained an Auburn fan until my oldest daughter became a student at the University of Alabama. Suddenly it wasn't right to cheer against my Alabama anymore. Our daughter graduated from Alabama for both undergrad school and law school, securing our family's status as Alabama fans. Why did I become an Alabama fan after being an Auburn fan for decades? Because it was the school my daughter loved. Because I loved her, I loved what she loved. "For the Father Himself loveth you, because ye have loved Me, and have believed that I came out from God," (John 16:27). When you love someone, you choose to love and care for what they love. This is true within the Trinity as well. God the Father loves us, God the Son love us, God the Holy Spirit loves us. Because each of member of the Godhead loves us, our love from God is compounded and multiplied. We are love beyond measure and beyond what we could possibly imagine. I work with a tremendous group of women and we have developed great teamwork. We work together, each accomplishing a part of our goal, without anyone giving particular direction, sometimes without even speaking. We know our tasks so well, and are so well-trained in assessing a situation, that we can see immediately what has been done and what still needs to be done and we just do it. It is as if we can read each other's minds, actually it is better than that, it is as if we had the same mind. "Be of the same mind one toward another. Mind not high things, but condescend to men of low estate. Be not wise in your own conceits." (Romans 12:16). As Christians, we are to be "like-minded". We are each unique individuals with unique backgrounds and histories, so some might ask, how can we all have the "same mind"? We are each to seek the "mind of Christ" (Philippians 2:5). This is especially important in times of conflict when our brains and our feelings don't seem to agree with one another. During these times we should purposefully come together to seek the mind of Christ in the matter. We should admit that none of us have all the facts, none of us perfectly assimilate the information given to us. Above all we should follow the instructions of the Apostle Paul to "be not wise in your own conceits" (Romans 12:16). The Scriptures tell us that we have "the mind of Christ" (1 Corinthians 2:16) and also that "if any man think that he knoweth any thing, he knoweth nothing yet as he ought to know" (1 Corinthians 8:2). When we are in conflict with a brother or sister, and we feel that fleshly pride and indignation rise up in our hearts, we can know one thing, it is most likely the direct opposite of the Lord Jesus' "meek and lowly" (Matthew 11:29) spirit and mind. So just what is the mind of the Lord Jesus like that is now by faith our mind? It is a mind that does not seek to exalt itself, but willingly sets aside all rights and privileges for the lives of others. It is a mind that gives up reputation and position for the sake of love. It is a mind that is humble, meek and lowly of spirit. This is our example and indeed this is the mind of the very Spirit of God living in us as believers. By faith, we believe the Scriptures are true and that this mind is now our mind. The truth of the matter is we do want the "mind of Christ" in every matter above what our fleshly desires and thoughts may try to tell us we want. When we begin to approach our situations, and especially our conflicts, with this in mind, we will more and more begin to see that "same mind" exhibited in and through us and our fellow believers. In our Sunday night services, we have been studying the book of John. When we reached this verse the question arose, exactly how do we as Christians love each other? How do we as Christian love one another? We be with them, both in body and spirit. We empathize with them. We forgive them. There is not one of us who has not needed forgiveness at some point, we should all be quick to forgive as well. I think this is definitely a good start in how to love each other. Then the question began to grow in my mind about putting these into play in a practical way. You see, as we go through our day we encounter many people whom we know absolutely nothing about. We do not know if they are believers or not. So it would behoove us to treat all men in this manner, so that we are kind and loving to all. for he that loveth another hath fulfilled the law." and toward all men, even as we do toward you:"
Several years ago I was walking through Dillard's and saw a beautiful red leather jacket. I tried it on and loved the fit. In fact I loved everything about the jacket. . .except the price tag. So I left it on the rack. I have regretted it ever since. I am extremely picky about jackets. I don't like lapels. I don't like collars. Being tall, it is important that the sleeves are long enough. Not any red will do. . .I don't want rust, I don't want cranberry. . .I want RED. The jacket at Dillard's met all my pre-conceived criteria, except for the price. It was exactly what I wanted, the real deal. Since then I have tried on dozens of red-hued jackets, none of which come close enough to cause me to purchase them, even at a quarter the price. They are not the "real-deal", they fall short of my standard of perfection for red jackets. I have searched Ebay and Amazon for the elusive red jacket of my dreams, but none have met up to my list of qualifications. Many times I have heard people say, "If I do more good things than I do bad things, then I will go to heaven." This would imply that anything we do can have good merit in and of itself. Yet the Scriptures tell us that apart from the saving work of the Lord Jesus, "... we are all as an unclean thing, and all our righteousnesses are as filthy rags;" (Isaiah 64:6.) Our good works can never be accepted by a God who is perfectly holy because they don't meet up to the standard of perfection. What is that standard of perfection? The Lord Jesus Christ. His sinless life is the standard of perfection. If we desire to reach Heaven on our own merits and works, then we have to be as perfect in word, action, thought and motive as He was, and He was without sin. All we can do is to humble ourselves before the Lord and be thankful that He is a God that "delighteth in mercy" and who is "good, and ready to forgive; and plenteous in mercy unto all them that call upon Thee." We confess that we cannot in and of ourselves obtain the path to Heaven, that we have all "sinned and come short of the glory of God." We seek His grace, mercy and salvation provided through His Son, the Way, the Truth and the Life. Then God wraps the righteousness of His dear Son around us and declares us His child as well. Only His Son and His righteousness meets the standard and we must accept it by faith as a freely given gift.